Have you ever tried L'Occitane? Their new Immortelle line is my first introduction into this brand! Let me tell you, these products have made me a new L'Occitane fan!!! According to L'Occitane, the island of Corsica is the home of an Immortal Flower called Helichrysum (which means the Golden Sun). It is a flower that does not fade, even when it is picked. L'Occitane set up an organic cultivation program which has now preserved this flower and over 3 billion Immortelle flowers are harvested every year now for L'Occitane. L'Occitane has patented the amazing anti-aging properties of the organic Corsican Immortelle. The key extracted ingredient? Neryl Acetate. L'Occitane is still researching this amazing flower. They have 5 more patents pending! The Corsican Immortellle Flower works at the "heart of cells": DNA Protection and DNA Repair. All of the products in the Immortelle line are infused with the Helichrysum's anti-aging ingredients. I tried out two products from this line: The Immortelle Divine Creme and the Immortelle Divine Eyes. To find out how I liked these luxurious products, please click "read more" below! Before diving into my review, here is a quick note on my skin type and skin concerns! It always helps me read a review when I know a bit more about what the reviewers skin care concerns are. :) My skin is combo: combo-oily in the warmer months and combo-dry in the winter. I am also currently pregnant. So, I am limited with what I can use as far as anti-aging and anti-acne products (no retinol and no salicylic acid). I am normally a bit acne prone. Pregnancy has increased this and I have been very prone to breakouts. I am in my late 30s. So, I am seriously concerned with preventing signs of aging. I have no major lines nor wrinkles yet. However, I do have some fine lines around my eyes which are especially noticeable when my skin is dehydrated. 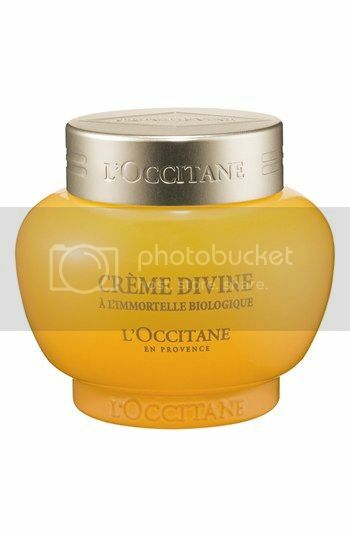 L'Occitane's Creme Divine is the ultimate luxury moisturizing creme. It is, hands-down, one of the most luxurious and rich creams that I have ever used on my face. It is extremely rich and hydrating. Yet, it does not feel "heavy" on your skin. Plus, I adore the unique scent...it is hard to describe...a fresh floral and herb mixture? Either way, the scent is intoxicating! The packaging is beautiful, too! Even though I have plenty of storage space in my bathroom, I like setting this beautiful yellow antique-inspired glass jar on the counter by my sink beause it is so pretty!!! I only need the smallest half-of-a-pea size amount to moisturize my entire face. The creme comes with a little spoon. I just scoop out about 1/2 a pea size amount and that is enough for my whole face. I apply this creme as the last step in my skincare routine in the evenings. So, that is after any serums or treatment products. Yes, this creme is super expensive (retails for $106 for a 1.7 oz jar), but a jar will last you a long time because you only need a very tiny amount for each application. I love how dewy and glowing this moisturizer leaves my skin. When I apply this in the evenings, I awake in the mornings to plumper and softer skin. This creme really does leave your skin velvety smooth. Even my husband has complimented how soft my skin has been since using this creme. Plus, I have not experienced any breakouts since starting this creme. That says a lot since my skin has been somewhat more breakout prone with pregnancy! So, I love that this rich moisturizer works without increasing breakouts. I absolutely adore L'Occitane's Creme Divine and will continue to use it!!! Unlike the rich Immortelle Divine Cream, the Divine Eyes eye cream is very lightweight! I actually would describe this product to be more of an eye gel than an eye cream. It looks like an eye cream when you pump it out. However, when you smooth it into your skin it becomes gel like and it absorbs nicely leaving a slight dewy sheen and a smooth texture. 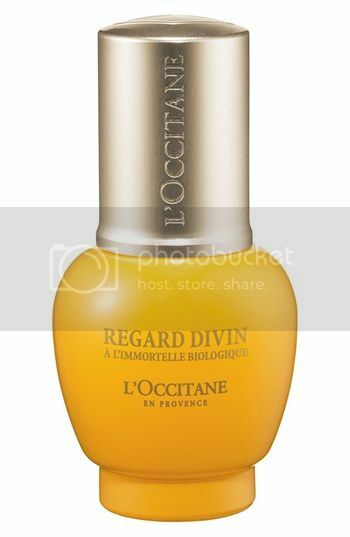 According to L'Occitane, Divine Eyes has three patents and it is enriched with the anti-aging properties of the Immortelle flower which targets the heart of your cells to restore your skin. Just like the Divine Creme, the packaging is gorgeous: an elegant yellow glass pump bottle with a gold lid. The pump dispenses just the right amount of cream (plus, ya'll know that I dig eye creams with pumps!). I really enjoy using this eye cream. The key feature for me is that it is very gentle and does not sting nor irritate my eyes. I apply it in the mornings and evenings after washing my face. I have not seen any dramatic results yet. However, I do feel that this is a nice eye cream as it moisturizes well, plumps the eye area, is gentle, and provides a nice base for under-eye concealer and makeup. 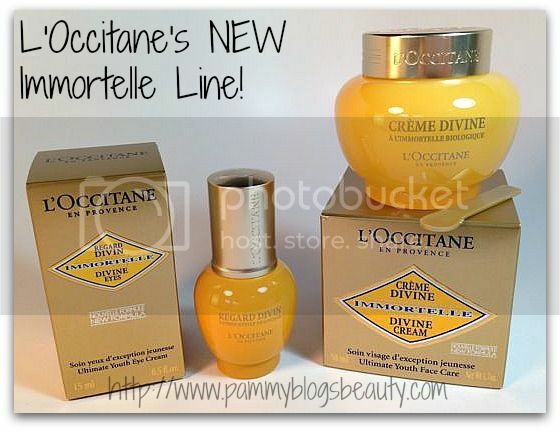 Overall, I really enjoy using the L'Occitane Immortelle line! It has been a fabulous introduction into the brand. Plus, I am really especially in love with the Divine Creme! :) It will be a new staple for me and it will be perfect to use throughout the cold months of the Fall and Winter. Have you tried L'Occitane? What do you like from the brand? I would love to explore L'Occitane further!!! Thanks for sharing these great products.